Parenting is hard work. This past week I had a few hard days. One of them included screaming children for a good majority of the day- the preschooler was yelling and kicking me and the toddler was miserable and teething. Despite the situation, I ended up being a good parent that day. I responded as best as I could (positively), dealt with the behaviors, kept my cool, and survived. I contrasted that to other days when I have had similar experiences with the kids and I've lost my temper, yelled back, and just felt out of control and really angry. I wondered what made the difference in my attitude on that day and I decided to make a list of ways that I have learned to deal with my own anger as a parent. I'm hoping that maybe my ideas can help other parents as well. None of them are really new ideas, but they are good reminders for me on rough days. 1. Recognize you can't control others, you can only control your response to them. Be positive. Set limits if needed. Recognize what is in your sphere of influence and what is not. 2. Choose to look for the good. Being nit picky or focusing too much on what your child is doing that is annoying you will make you more frustrated. For example, if your child keeps saying, "No mommy" or hitting a sibling, instead of saying, "don't tell me no" or "stop hitting," think of what you want your child to be doing instead and tell them. Sometimes we forget that kids are just kids and they are still learning. Often we tell them what not to do... but they don't know what to do. 3. Give yourself a time out. Remove yourself from the situation. When my daughter was first born, my son would have terrible tantrums. I would pick the baby up and say to him, "Mommy needs a time out. I'm worried I might say something mean to you. I am going to go upstairs for a few minutes to my room to cool down." I would leave our bedroom door open so that I could see/hear my son, but I would remove myself from the rage and take some deep breaths. It really helped me calm down and be able to better deal with his behavior in a positive way. This is the hardest thing for me, but the thing that I notice impacts my ability to cope the most. I have recently started running a few mornings a week at 6:30am with some friends (without kids). I have such a better attitude to start the day and deal with any problems that arise because I have gotten my exercise in. If an afternoon is hard, we often grab the stroller and go for a jog. It is amazing how quickly moods change when we are working out. 6. Pray, meditate, or seek inspiration. I pray every day that I will have patience with my kids. I also pray that I will know how to be a good parent. During the hardest parts of the day, saying a quick prayer can help me get an instant boost. Sometimes I just sneak in the bathroom and lock the door and go to the bathroom by myself! The quiet moment alone sometimes helps me chill out. On our worst day this week, I sent my husband an SOS and asked if he could come home thirty minutes early. It is rare that I ask him to do that, but I needed a break. He responded by doing exactly that AND making me a special treat when he got home. His arrival cheered my son up too and changed the mood at our house. I was so grateful! 8. Spend time with friends or family who are supportive. When a day is looking like it is going downhill, I love to send a quick text to friends and have them meet us at the park for a playdate. It is amazing how your perspective changes and how easier it is to not take things your kid's do personally when you are surrounded by other supportive friends. Do you ever find it hard to keep your cool as a parent? I would love to learn from your experiences and wisdom. I have only been a parent for four years now, so I know I still have a lot to learn and many more years to work at becoming a better parent! Please share any tips or advice in the comments below. If you're new to Toddler Approved, WELCOME! We'd love you to drop by our Facebook page and join in on the conversation. We are always sharing great ideas we find about parenting and creating! Are you tired of nagging, reminding and yelling at your kids? Sign up for our upcoming FREE webinar with Amy McCready of Positive Parenting Solutions and get some new tools to help make your home more peaceful! PS. You can find some of our other parenting posts on our Best of Parenting page. I love the first one. This is a rule for dealing with everyone. You can't control them, you can only control your self! Great advice! You're right. You can only control yourself and your reactions. I would ask anyone caring for an infant or toddler that is crying or fussing nonstop and you feel as though you are on the edge....take a deep breath, put the child down in a safe place and do not shake a baby or toddler out of frustration. Shaking kills. Please tell anyone who cares for a child about Shaken Baby Snydrome. It's very real. It can be prevented. Thank you. I almost laughed out reading this "take a deep breath, put the child down in a safe place and do not shake a baby" but yes I understand the situation. Just willing to say that you guys can take advise from experts in this field. check this site or find one yourself. I learned this from a mother of six. when my young kids would argue and fight (I am a grandma now! ), I would have them sit next to each other and hold hands. sometimes I said they had to look at each other but they couldn't laugh. It almost always worked, and they still get a kick out of the memory of doing that! In the end, they'd go off and play and get along! These are awesome tips! I think getting plenty of sleep makes a big difference for me. Slowing down is also something that helps me feel less edgy. I find that when our day is packed or I'm trying to do too much is when I get snappy. Sometimes I put everyone in the car and we take a short scenic drive and everyone feels better when we get back home. Great suggestions. I totally agree! Slowing down and thinking about the big picture really helps me too. Recognizing how precious little moments of childhood are helps me put down the to-do list and just focus on the kids. I completely agree! I try not to schedule anything like doctors appointments too early in the morning because when I am rushing to get somewhere I start getting agitated. Having plenty of time in the morning makes our day so much more peaceful. We are definitely not morning people. Thank you for these reminders. I definitely need to put them into action. I am a very patient person... one of my best qualities. I am far less patient now that I have kids though ;). I agree with taking a break and I feel being honest is so important. Imagine what we are teaching our kids by saying, "Right now I am starting to feel really angry. I want to make sure that I am not angry when we talk to each other, so I am going to go over there. I'm going to take 10 deep breaths and I am going to come back here with a calm voice and a smile. I hope you can take advantage of this time too." By being honest and detailed we are setting up frame work for the kids to handle their own anger. You and me both Jill. As a teacher my classroom aides were always remarking about how patient I was. Now I feel like I have to relearn that virtue every day. :) I think the honesty you mentioned is so great for teaching children how to resolve their own conflicts now and will be so useful when they are older and have their own spouse/children. Your children will be so lucky to see this appropriate skill modeled and will be so successful in relationships later in life! I totally agree Emily! Our own kids really know how to push our buttons, don't they? :) I only had 2 students that ever figured that out in six years teaching. Love the idea of printing these out! Great reminders. Thank you for this. My toddler has been challenging lately with spitting, hitting and screaming. I appreciate the suggestion of telling him what to do rather than what not to do. Seek the help of a psychologist if you are finding your anger to be a daily thing, they can help you see why you are really angry and better ways to cope so that your innocent child(ren) isn't paying the price for your undealt with issues. Such a great reminder Kara! Some parents do need to seek out professional help for their struggles or even anger/frustration that is being channeled incorrectly. Thank you for this post! It was a particularly trying week at my house, and this post was very timely. So glad to hear that! It is one I have been wanting to write for awhile. I think it is one I need to re-read often. I agree so much with the positive perspective. I have 5 sons under 10 years old. One of them is always needing correction. Lately I have been asking God to help me love them. He showed me that what I am focused on controls my reaction either in love or anger. If I am enjoying a positive outlook I notice their good behavior and am ready to compliment them, enjoy them. Otherwise I only see what they do wrong which leads to anger and criticism. Oh, I love this post! TY! This is great - we're having challenging times - T has learnt NO and repeats it to everything and anything, J is 2 and a half (enough said! )I fail at keeping my cool at times and love your list on how not to, but I know it happens - one of the things I always do if I do lose my cool is that apologise to J or T immediately and say that "Mummy is sorry she shouted - she needs a little sit down" I usually then switch on the TV for them for half an hour and make myself a hot cup of my favourite full strength coffee and relax with them as well. This is such a great post with great reminders. It is so good to know that there are others who are struggling with the same thing as I am :) One of the things that I really need to work on is taking care of myself physically. Because you're right..one can't function well without proper sleep, food, & exercise. Thank you so much for posting this. Wow! Thanks so much for this blog and this post! As a mommy of three girls, a caretaker of one disabled adult bro-in-law, and new puppy owner, my fuse seems to be increasingly short. Sometimes my "toolbox" of great-mommy fixes and past experiences all look fantastic, but in the thick of things, I sometimes get so overwhelmed, that I "snap" before I even see it coming...I might go all day, patiently and positively co-existing with my household, and then in one instant (normally when everyone comes at me simultaneously) I completely lose it. How do I keep my cool and model good behavior, even at my worst moments?! Excellent tips. In terms of dealing with kids and "tough" days, I've found learning about validation tremendously helpful - two books I like are "The Power of Validation" and "Raising Our Children, Raising Ourselves." I loved "Raising Our Children, Raising Ourselves" it was great and really struck a chord with how I want to parent. I need to check out these books! Thanks for sharing guys! Thank you so much for this. I totally needed it. I really need to work on telling my kids what I'd rather them be doing instead of telling them NOT to do something. I'm also loving the idea of verbalizing to them that I need to take a time out so I don't take my anger out on them. I heard a quote recently and I wish I could remember who said it, but it goes, "The only time there should be yelling in the home is if there is a fire." This is my goal! Which hopefully would mean there would be no yelling at my house. I'll be back to reread this post on hard days! Thanks Liz :) I like that quote and need to remember it. Even after writing this post today I still had a short fuse once today and got so annoyed at myself. It was probably bc I was up too late blogging... once again not following my own tips. Tomorrow is another day! That was said by David O. McKay, former president of the Church of Jesus Christ of Latter Day Saints. Thanks Emily! :) President McKay has said a lot of awesome things! I love that you posted this. Sometimes, I feel like I am the only parent to loose their cool once in a while. I feel awful when I yell back at the kids. I sit and wonder sometimes too how I handled the same situation so differently on different days. Thank you for the wonderful tips. I'm so glad there are other moms who want to be patient, who want to pray and who love the true innocence of children! Awesome blog! I am glad a friend posted this on Pinterest. I had a week exactly like that this week, and this was exactly what I needed. Thank you! Thank you for this. I suffer from post partum depression and suffer with anger alot! I have a 28 month old son and an 8 month old daughter so I know exactly what you mean about taking care of the baby and the toddler tantrums. I saw a psychiatrist for 3 months but it seemed she was making things worse within me and my marriage. I am a christian and the way she was trying to "help" me was totally against my beliefs. Then just recently I found out that my church offers free services from psychiatrist that volunteer their time. In one day I got more from my church than the 3 months I spent with that other lady. Also wanted to share yesterdays teaching at church Mark 4. God says: Peace. Be. Still. I think this somes up what you have said. Thanks again! I really needed this this week! My 5 year old is extremely strong willed and goes through these stretches where he is just not easy to get along with, and currently we are at what I hope is the end of one of those stretches. I love me the "Mommy time out" I usually try to pair it with a guilt free shower, or bath to really help me relax and regroup. I used to do your last suggestion a lot more than I do now, for awhile it seemed that every Friday (mommy day, I work M-Th) I would be having play dates with friends or running errands, but I've actually found that on the days he's being the worst it's because I've been so busy or trying to accomplish so much that he hasn't been getting the attention he deserves, and then I remind myself he's only just turning 5, he's not going to be this young forever, and let my dishes, errands, and friend time wait. That's what helps us, sometimes....Then there are days where distraction is key. Wonderful reminders!!! Sometimes you can get so caught up in the hustle and bustle of everyday that we can find ourselves in a reactive state!!! These are great reminders of getting back to those basics:):):) Thanks for posting!!!!! These are great tips! I try to react positively with my son, but there are some days that are just rough. I don't even think my son is acting any differently (he's just being a toddler), but it's my attitude that is different. Your post fits nicely with what I wrote about today (my son coloring on the floor). Thanks for sharing! I've found that sometimes my kids go crazy because they're bored. It's easy to get wrapped up doing my own thing and forget they need mommy time. Get a simple craft going or maybe go to the park with them and they get back on track in no time! This is a great post! 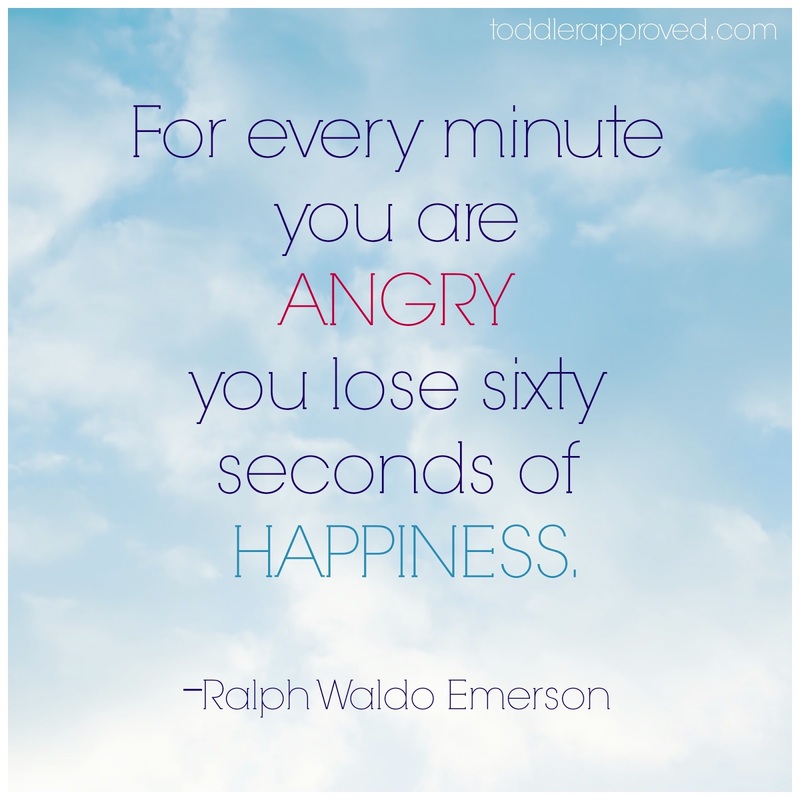 Definitely great reminders of how to handle anger. It is SO easy to get "sucked into" a child's rage ... especially when we, as parents, are drained! I love your suggestions and will keep them handy for not only myself, but the parents I work with! I am in that same boat! My 16 month old will just get really upset even though she can communicate the things she needs pretty well. I just end up sitting beside her and wait for her to calm down, even though I sometimes feel like a bad parent for not trying to make her stop. Hopefully she'll learn that mommy will always be beside her even when she's angry! Thank you so much for posting this, all the tips are awesome! I planned on focusing on some of these this week but since it's Tuesday, I failed on some! Especially the Me time with is my excerise. I pinned this to my Pinterest board so I can keep reminding myself of my new goals. It's very hard being home w/a 6yr homeschooler and 1yr twins but I am getting there and getting better! Thank you again, Love it! Love the mommy time out... I've had to do that a couple times! My son is only 14 months but sometimes his "fit throwing" can really get to me....That's when I look at my husband and say I need a time out and go take a bath or just go watch tv in the other room for 10 -15min and chill out! made a mistake and you will learn from it. Lately, I have found the most important thing above all it so just take time to love and cherish my kids. If I feel like I'm getting frustrated and my fuse is growing short, I take a look at each one of them in a different light. As my own flesh and blood who are so tiny and new, so full of wonder and learning and changing so much everyday. And I think about how these days will soon be over. Then I tell them how much I love them, tell them all the things they are doing RIGHT, then I squeeze them as hard as possible without hurting them and smother them with kisses! They are so precious and once I take a step back and think about that, that hug can add feet back to my fuse! And then I think of something fun to do that we don't do often, like having a picnic snack and story time on our family room floor, a craft, an experiment, or something like that. Something to change up our day and give us a fresh new attitude. These are good reminders, indeed. One strategy I've picked up on in recent years is when I most feel like blowing up and implementing physical discipline, I do the exact opposite, I pull my child close to me and hug them and comfort them. It's amazing how many times this has worked when they're angry, and I'm angry and providing some loving, fatherly affection has soothed both my anger and theirs. Of course there are times when this doesn't work, but reasonable judgment can be your guide as to when this may (or may not) work. Fantastic post! And this week I had a PRETTY rough week so I feel you! We do a lot of these, too. Another tactic I try to use is hugs. When I'm feeling just thoroughly frustrated and fed up, the last thing I want to do is give out hugs. But when I do, I remember just how tiny the little ones really are. No matter what is going on or how badly the day is turning out, these are my children, and I love them no matter what. A hug reminds all of us of this. Something I have heard that was really helpful for me, is that when your child is pressing all of your buttons, especially young ones, say out loud, "You are such a delight!". Minus the sarcasm you are probably feeling. Saying the words, especially at my wit's end, helps me remember exactly how precious my little girl is to me, even when she tries my patience. When I feel like I'm going to lose it, I start doing jumping jacks or jumping around like Richard Simmons. I'll even pull out a wooden spoon and start belting out songs. The kids are usually so surprised, they forget what they were doing and start laughing. It gives me a chance to chill out my emotions, get exercise and see my kids laugh. I only do this in desperate situations, but it seems to work. Great article! I am the mom of a 7 year old but even this age has its challenges. It is important to take a step back and look and the big picture. Instead of getting angry use the opportunity as a teaching moment for both you and your child. Just found this on pinterest. Really these are the best tips/advice I've heard yet. Love them all, especially #2. I've never thought of it that way before! These are good. When I was going through a stressfull time I found my fuse to be short. I read a great book called scream free parenting. Lots of good advice. If I could add one more tip. Take inventory of your kids for a few days. Know there good times and bad. Don't put your kids in a situation were there is bound to get into trouble. Like the grocery store during nap time. A couple of weeks ago I found a book for kids called 'Sometimes I feel Angry' at a yard sale, I'm guessing Amazon or somewhere should stock it. My daughter enjoys the book and it gives suggestions about positive ways to deal with anger. We both apply them, they work for me as well as for her! It helped me a lot to think of things from a 4 year old perspective. One thing (not from the book) that I am finding often works is to do something absolutely silly to break the tension. For my daughter that is getting on my bed and running on the spot as fast as she can while I do the same on the floor next to the bed. We have a race. Rather than time outs, we have time ins, where we stop and cuddle on the sofa or bed with a book. Love this. However, how do I get more sleep? I was looking on finding ways to deal with anger. I came a cross this site http://www.ways-to-deal-with-anger.sitemoxie.com and helped me out a lot. I appreciate your honesty! I have felt the same way and I have much less going on than you. Definitely find a way to get yourself a break from time to time... sometimes for m, a break is just changing up the routine and doing something purely fun with my kids that makes me smile too. It doesn't have to be away from them-- though sounds like you need that too!! I can understand your frustration. I'm a single Mom. If I have two days off in a row, by the end of the second day, I'm ready to head back to work. Being a stay at home mom, I think is by far the hardest job. I love my kids to death, but we all need a break! A good tip I learned is letting everyone take time out in the day for themselves. During the day, we each take thirty minutes, to do what is needed to regroup. Usually for me, this is right after I get home from work. They most often want to color and draw and I will literally lay on the floor and just relax, stretch or breathe, or even have a cup of coffee on the porch. This is important, cause we are always with each other, or other people. It's nice to just take time to yourself & it can be done with the kids there. Also, you could get together with close friends with kids and start swapping kids every other week, even if it is just to go run, go grocery shopping by YOURSELF or even go read the paper alone while having something to eat. At the end of our day, I do whats called "quiet time" I don't let my kids watch much TV, so after everyone has been bathed and ready for bed, we will watch some TV and snuggle. It's a time to wind down & have some one on one time before bed. I hope this helps. Good luck to you! You're in my prayers. I hate blogs in general... but this really touched my heart! Thank you. Wonderful post! Being a mom of twins, sometimes they can just drive me crazy lol! Sometimes I have to take a moment and remind myself that being angry isn't going to help me at all. Also, I think of what a blessing it is to have two healthy babies! Continued blessings to you and yours!! love this post! one thing I am working on is breathing (like yoga) when I get mad and when they get mad immediately teaching them to do the same. I often forget but I am getting better and it seems to work a lot, for all of us! Great piece! Like ChariT, I'm a mother of twins. Mine are approaching the dreaded "twos" rapidly, and I find that there are days where my patience runs short. The things you've listed all have affected how I manage my patience and anger. You've hit the nail on the head with this one. Thank you for sharing. I think just knowing I'm not the only parent who gets overwhelmed & frustrated, is a relief in itself. I'm a single Mom of three (five & three y/o twins) & some days can be brutal. It's easy to get side tracked. This is great advice & it couldn't have come at a better time. A few things I've learned, is nothing gets accomplised in the heat of the moment. I tell them we can speak once they have calmed down and then it's a face to face conversation. I also learned of the calming jar, with the glitter water. It really does wonders. For myself, I breathe. It can become so crazy, that sometimes we forget to do something so simple. Taking a deep breath and letting go of the negative energy, does great things for the mind & body. Thank you for sharing this!This is a great advice! Thanks, these are great! I need to be reminded of #1, especially. This morning, my 20-month-old had me up at 5am. And I wasn't having any of that. Lol. But after a while of dealing with foolishness, I got frustrated, which generally doesn't help matters. Frustration inevitably turns to anger. Thank you! As I was reading this, I had a frustrated, tired little toddler (who was also too hyper to fall asleep) in her crib. Ironically, I was also eating a chocolate bar to help me calm out my frustrations as I read your comment about soda and chocolate -haha! Your advice put things back into the perspective I needed. Thank you. This is good advice, all of it. :) Awesome stuff. Some things we do to deal with anger also is, I do guided meditations with my kids - this isn't as simple as it sounds, as one kiddo has ADHD and the other is autistic - meditating quietly is hard work!! I also try to make myself really really present to the moment, when everything is getting too much. Because unless someone is actually dying right now in front of you, life is rarely as bad as we feel, in the moment. Things, right now, are almost ALWAYS, actually okay. Very good advice! You could also read all of the Love and Logic books. They have a way to put things into prospective for people who are continuing destructive parenting patterns from their parents. They also believe that its your attitude and the way that you deliver consequences that matter. Thank you so much for your fresh perspective on things and for your encouragement!! It was becoming one of “those days” very quickly today. While I took a moment to re gain my composure I ran across your post on Pinterest. Thank God!!! I really like every point you make and especially how you explain your taking a time out as I need to learn how to articulate that better to my toddler. Blessings to you and your family! Loved reading the complete article. 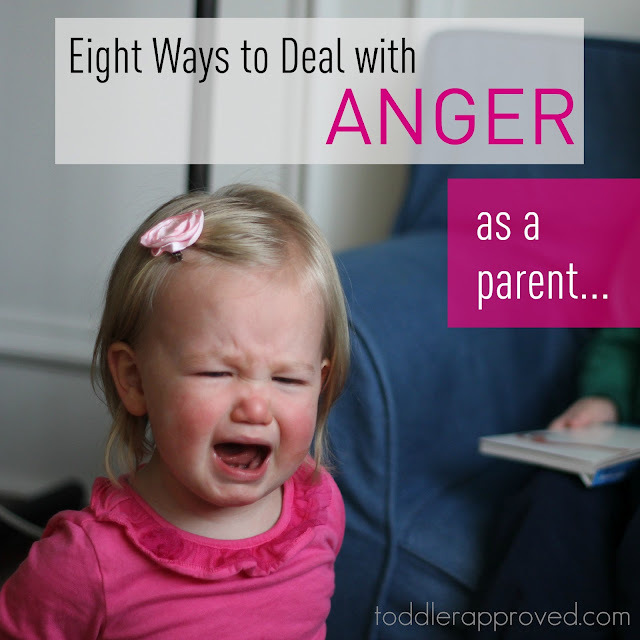 Its very true that we do get angry while dealing with kids. 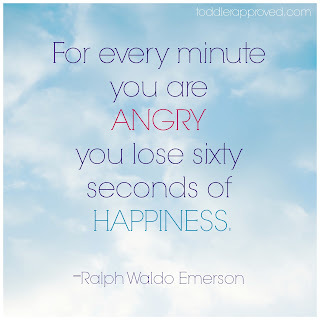 But doesn't it make our day worse as we tend to get irritated by anything during the whole day. Praying helps us create a positive attitude to deal with the situation in hand. Exercising is undoubtedly a great stress buster and sharing our feelings with our friends can help us get better solutions. Great tips. I've had some difficult days lately too and was thinking that this week I need to restart: exercise in the morning, yoga and meditation, taking breaks, asking for help and having a kid-free night out with a friend. That's the plan! Did anyone mention humor! If you can find the humor in the situation (as there often is with toddlers) its amazing how the anger just evaporates! Literally, as I am typing this, I hear my daughter from her high chair mutter to herself, "that not a booger..." Me, "What is it?" "Hummus!" How can we get help from family and friends when every time we do they don't want to watch the child or they can't come over because they have children of their own to deal with and sometimes are to busy to come over so they say. I have a 6 month old son and all of the time that I ask for help I always get sorry we can't come over or sorry we can't come get you unless you have gas money. I mean when they asked for our help we stopped whatever we were doing to help them but they can't do that for us. Desperate for help. We don't even have a car to take him out of the house every other day or when he gets really bad with the crying. I have no family to help us and my husband's family members won't help either but they can help with his cousin's child. Every time we ask his grandmother if she can watch him it is always a no. That's really tough and I'm sorry you don't have the support. I hope things have improved a bit for you. Have you joined any mums groups to try and make some new friends? Are you able to get out for a short walk? I know from the climate I used to live in that isn't always possible. If you get bad days and just need to take a break for a while, don't be afraid of sticking the tv on for entertainment for a while! As a new stepdad to a 4yo, this post is timely and very appreciated. Just came across this after looking at something that was posted on pinterest. I have a 2.5yo DD who is amazing and rarely tantrums because she can communicate so well, but she does have days that just push me to the edge. This post has been really helpful and hopefully I've come away with some ideas to help me cope with those days! Being 6.5 mo pregnant has taken away much of the patience I once had! Great tips. Will surely print it and paste on my fridge..
Be aware that children will readily absorb the emotional climate around them; if you’re wound up they will be too. Use clear, brief, simple commands and keep your tone polite, calm but firm. Children will pick up on any hints of stress, wavering or anger in your voice and this may make them more agitated or more persistent. Do not try to convince them by scolding, kids will easily understand by soft and loving voice. Many times they just want attention of parents. Your article is giving very useful information for parenting. Great post keep it up. Great tips, I really need them as lately I have been having a hard time staying calm.